The Jaguar or Panthera Onca lives in the Maya Biosphere Reserve where our Chiapas Arabica Coffee is grown in Mexico. It is the largest and most powerful wild cat in Mexico, and resembles most the leopard of Africa. Its body is compact with a broad head and powerful jaws, its coat is usually yellow, and it can vary from brown to black. The spots on the coat are more solid and black on the head and neck. They live around 12 to 15 years. The Jaguar has been Mexico’s most representative symbolic animal for Mexican ancient cultures. For the Maya and Aztec cultures, jaguars represented a symbol of distinction, mysticism, wisdom, power, strength, cleverness, leadership and exclusivity. Only the most brave and important warriors like the jaguar warriors, leaders and governors could wear jaguar skin on their costumes as depicted in Maya murals and codices. For Mayas, the jaguar was also known as Balam or Chac and considered a God. According to Mayan legend, The God Sun became a jaguar at night to walk into the dead’s world; the spots in his skin represented the stars in the darkness of the night. This jaguar deity is portrayed on the central panel in the Maya Temple of the Sun at Palenque Chiapas-Mexico. Today in Mexico Jaguars are in danger of extinction due to many threats such as habitat loss and illegal hunting, being the destruction of its natural habitat, the main problem affecting this exotic animal. It is estimated that the jaguar could become extinct in the Mayan rainforest in Yucatan and Chiapas within 50 years. 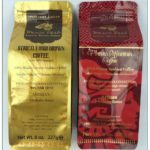 Maya Chiapas Coffee and Jaguars represent the Mexican culture, so each time you have a cup of Mexico Real Cafe you are immersing in the mysticism surrounding the evergreen rainforest from the south of Mexico and the Mayan culture.